Children and dogs no matter how well behaved should NEVER EVER be left unattended. Do not acquire a dog that is going to grow bigger than your smallest child. For children under the age of seven a small dog such as a Cavalier King Charles Spaniel, Bichon Frise or Shih-Tzu are more appropriate as they will never grow bigger than your smallest child. These breeds are designed to be lapdogs so unlike other breeds, enjoy lots of handling. If there are children in the house do not get a dog that is going to be bigger than the child as if it learns that it can knock the child over this may prove to be dangerous. If a dog is for the children the children must be old enough and strong enough to manage it. Again think very carefully about the dog you choose. It may be helpful to teach the children some responsibility for the dog by getting the children to carry out the daily poop-scoop, while also teaching the children about hygiene. Dogs are naturally clean animals. It is important that children are taught not to scream, wave arms and run around wildly with dogs as this may incite the dog to jump up and bite. 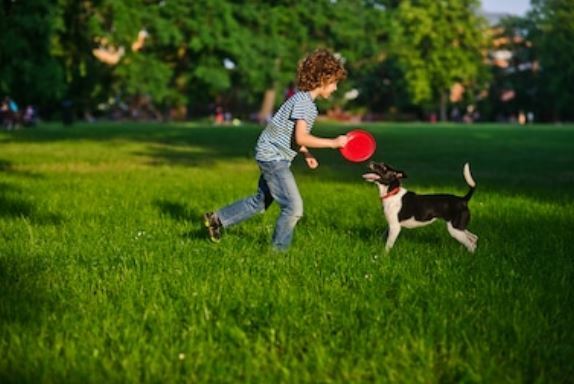 It is very important that visiting children are under strict supervision while interacting with your dog, as dogs will not tolerate unwanted attention from people outside their family/pack. If you think about it, neither do we! Children need to be taught how to pet a dog. Dogs should only be stroked from collar to tail. Do not allow children to pet an unknown dog. Dogs do not like to be petted over the head as from the dogs point of view the hand is like a low flying air craft, it makes them feel worried. Hugging is a human/primate social behaviour. Dogs do not hug. Close physical contact in dogs means both mating activity or aggression therefore children must be taught this and NEVER EVER allowed to hug dogs. Hugging makes a dog feel threatened and it will growl or bite to defend itself. Education is the key for a successful and happy relationship between dogs and children.